Welcome back for another installment of Workshop Wednesday (yes, I’m aware that it’s Thursday!) Every other Wednesday (and apparently some Thursdays), I share another way to make your workshop a more functional, organized space. 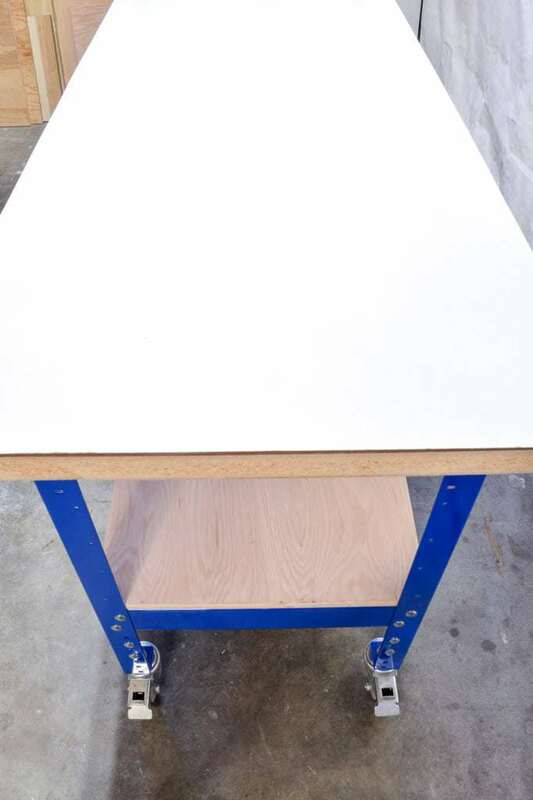 Last time, I showed off my amazing new Kreg workbench. This week, I’m protecting that new workbench surface from paint and stain splatters with a convenient workbench paper roll dispenser! 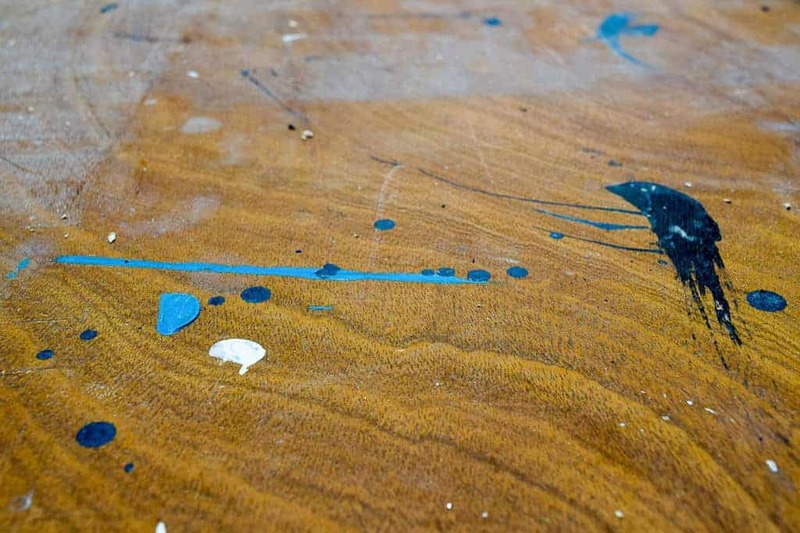 My old workbench surface was full of “character,” if you can call all those drips, scratches and spills character. However, sometimes those blobs of paint would transfer onto a new project, resulting in much swearing when it shows up on a freshly painted surface! When I built my new workbench, I used the same old door, but flipped it over so I could start with a clean surface. Then I attached a white panel to the top with Liquid Nails. I want to protect that nice, white surface from paint, stain and glue, but I’m also lazy! I’ll never remember to pull out a drop cloth to cover the workbench when I’m all excited to get a project finished. But if there was a roll of paper conveniently located right at the end of the workbench, I might be more inclined to use it! 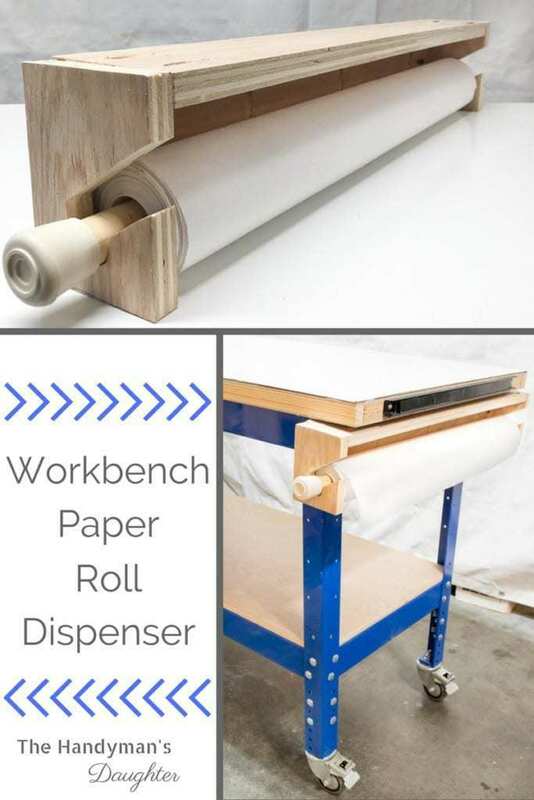 The dimensions of your workbench paper roll dispenser will depend on both the width of your workbench and the paper you plan to use. 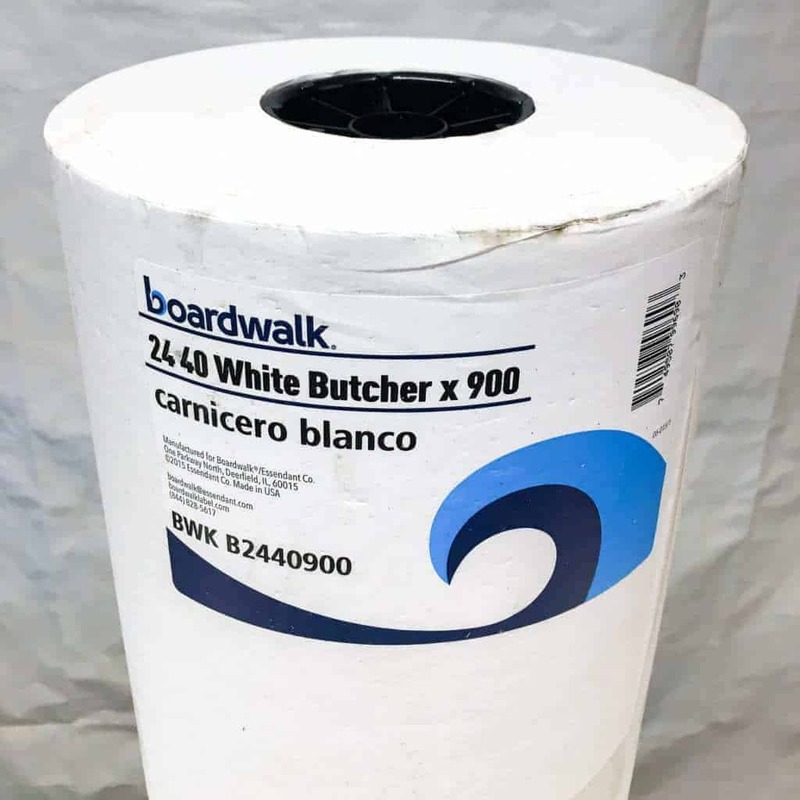 I searched high and low for 24″ wide rosin paper to no avail, so I went with white butcher paper. However, I was NOT prepared for how big a 900 foot roll is! This thing weighs 25 pounds, and would stick out from the end of my workbench by almost 5 inches! 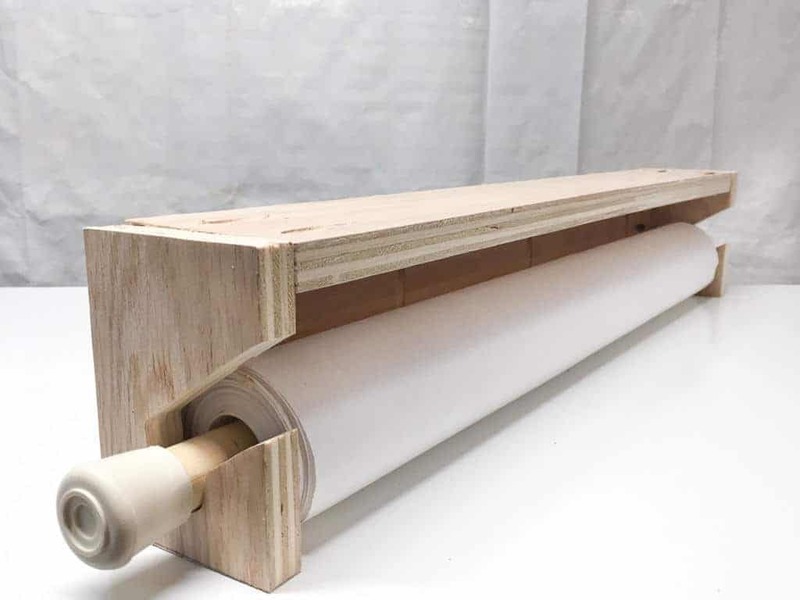 To break it down to a more manageable size, I rolled the paper onto a 1″ dowel until it was about three inches wide. I still have more than enough on the big roll to last quite a while! To build the bracket that will hold the roll in place, I used some scrap 3/4″ plywood left over from my workbench. 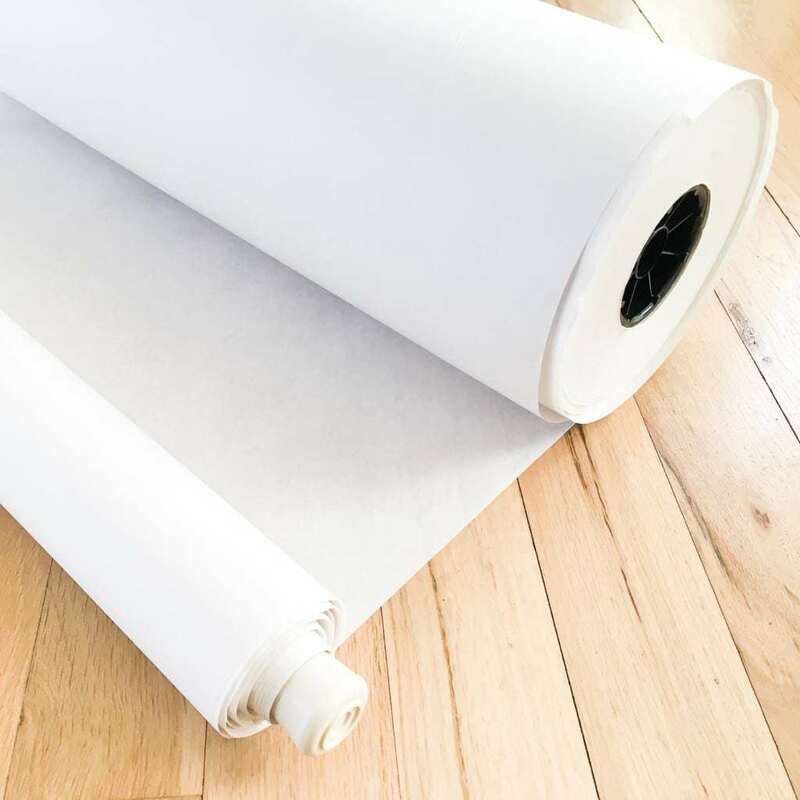 Cut two pieces to match the width and depth of your paper roll, plus 1/2″ for wiggle room. Join these two pieces together to make an L shape. 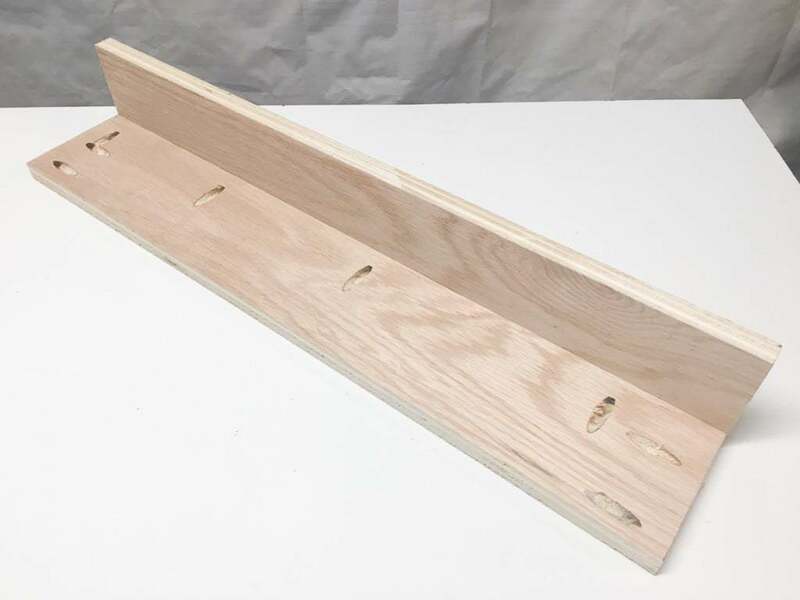 I used my Kreg Jig to make pocket holes for this step, but you could use any type of screws. The end pieces will hold the paper roll. 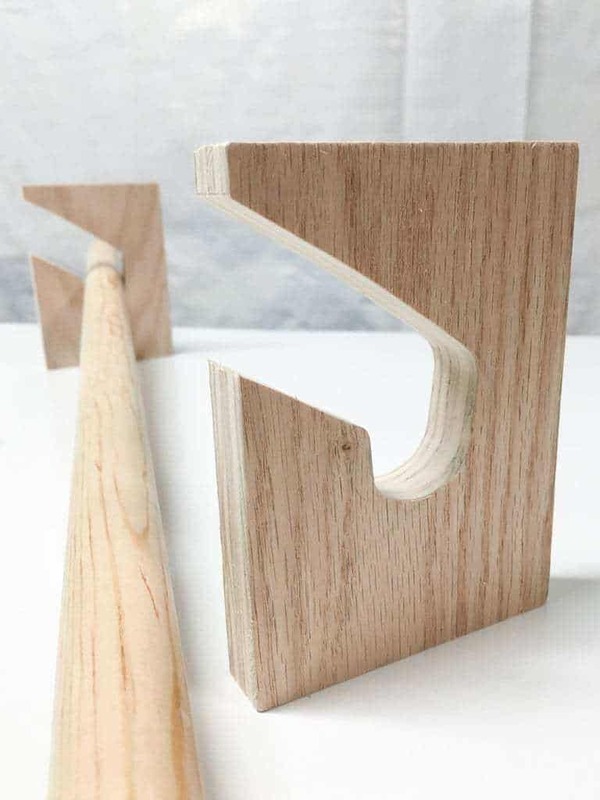 Cut them to fit onto the ends of the bracket you just made. Then, using a jig saw or scroll saw, cut out this slightly phallic-looking shape. 😉 It should be slightly wider than the dowel, so it can spin freely. 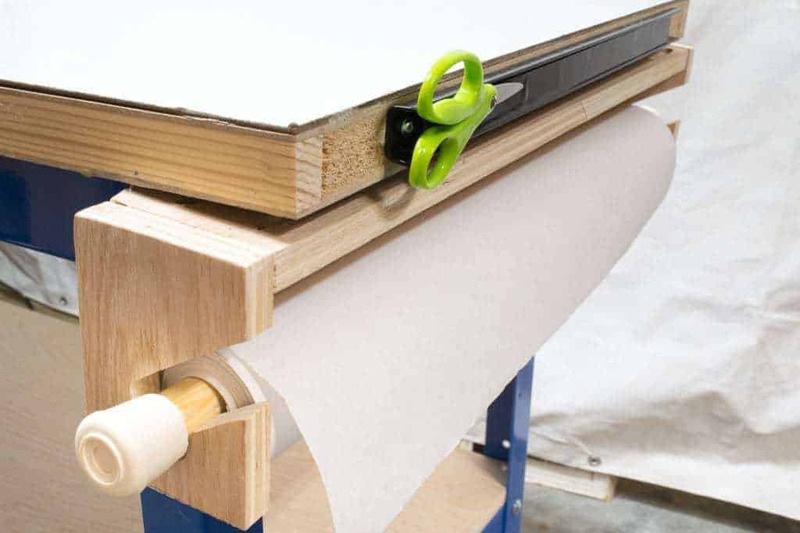 This will allow you to easily slip the paper roll into place, but won’t fall out when you pull the paper onto the workbench. Clamp the two pieces together when you’re cutting so they’ll be symmetrical. 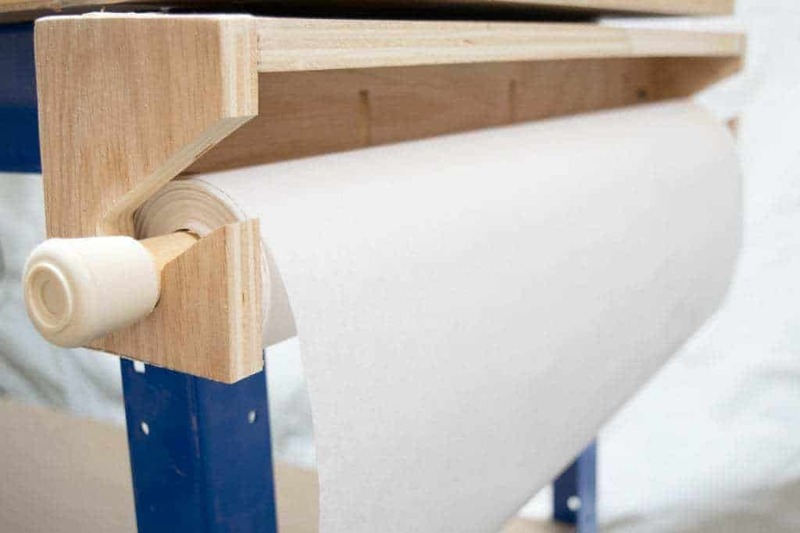 Attach these to the ends of the bracket, and test to make sure you can get your paper roll in and out easily. Trim the dowel so that there’s about an inch sticking out on either end, then attach rubber chair tips. This will keep the dowel in place and also pad it for the inevitable hip bumps that will occur. Remove the paper from the bracket, then hold it to the spot you plan to mount it. Mine will be attached to my Kreg workbench legs, which have convenient holes along their length. I marked the hole location on the back of the bracket with a pencil, then drilled a hole big enough for a 5/16″ bolt. 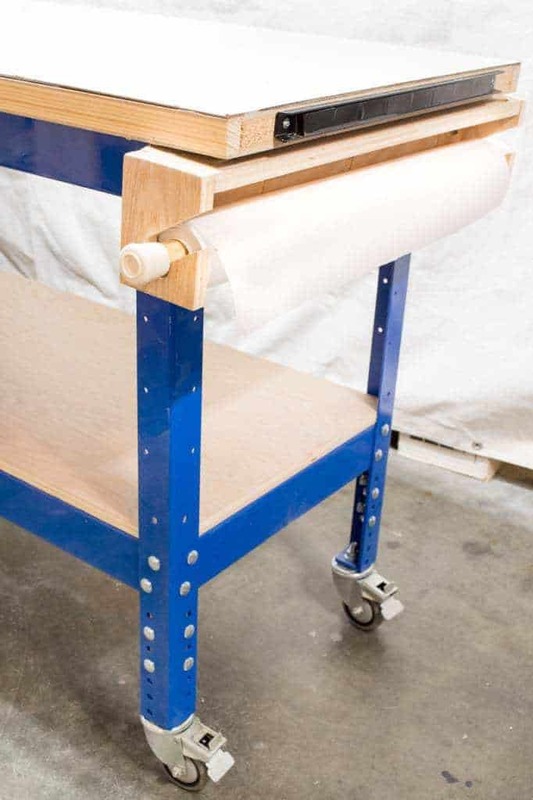 Attach the workbench paper roll dispenser to the legs. I added a magnetic strip to the end of the work surface for scissors and metal bits I tend to use often. My bracket is at a slight angle because the bolt heads holding the workbench together stick out from the legs. I might add some washers behind the bracket to even it out eventually, but for now I’m not too worried about it! Now I can just pull out a sheet of paper to protect my work surface every time I paint a new project! No more blobs on my white worktable! If you would like to keep up to date with my latest posts about woodworking, Workshop Wednesday, and more, you can follow me on Facebook, Pinterest, Instagram, or sign up for my weekly newsletter below. Vineta, I love this idea. It kind of reminds me of a little kid’s paper roll. We’re like big kids playing with paints and stuff 😀 Seriously though, this is so smart to build and mount it right on your work table. And the magnetic strip is fantastic. I bought a roll of white wrapping paper that’s thick that I’ve been on my breakfast bar for small projects. It makes it easier to photograph and keeps hot glue off the counter. We are like big kids, playing with big blocks and paint. 🙂 I got the white butcher paper for the same reason: better for photographs. I haven’t tested it to see how it holds up to paint, but I have so much paper, I could easily do a double layer and still have plenty left over for years to come! Really smart idea. I love the paper holder and magnetic scissor holder.